Ever wonder how the french introduce babies to food? We have just entered the phase in which our little Anton gets to experience food for the first time here in Paris. His pediatrician, Dr. Pierre Bitoun, has created a guideline on how to approach this very exciting phase of life and I've translated it here (the best I could!) for our readers. Considering France has one of the lowest rates of child obesity in the developed world, we thought it would be worth sharing. What they can eat and when? Starting at 6 months, start with 3 foods for 3 days and then switch to a different 3 foods, and so on... until the baby is familiar with all the basic veggie groups. This can help discover any allergies. You do not need need to use salt or sugar because there is enough in breast milk and in baby formula. To prevent allergies, it is good to avoid strawberries, citrus fruits, kiwi, egg whites and chocolate until babies are a year old. Start by introducing 2-3 teaspoons of food once per day at mid-day lunch time, after nursing (or a bottle). Gradually increase the amount to the point of replacing a mid-day nurse (or bottle) with food. Begin with a combination of 3 types of vegetables such as: 1/3 purée of carrots mixed with 1/3 potato purée (2/3 starchy vegetables) and 1/3 puréed green vegetables (which contain fiber but provide few calories) such as spinach, green beans, broccoli, etc. Introduce raw fruits (which contain calories and vitamins) after nursing (or bottle) at any time of day and also after lunch (food meal) too. Such as mashed bananas, pureed apples or pears, grapes or a mix of puréed raw fruits. After a few weeks, and when your baby is ready, you can also offer whole milk yogurt (in a glass jar at the supermarket) or petits suisses 40% fat (fresh cheese comparable to a thick greek yogurt) as a snack. After your baby becomes accustomed to food add some puréed meat (which contains iron) to the mid-day meal time. About 2-3 teaspoons worth. For example, a chicken, duck or turkey thigh, lamb, beef, hard boiled egg yolk, or fish: small fish such as whiting, sole, hake, herring, sardines and cod - (it is best to avoid tuna and salmon because of chemical pollution: mercury and high levels of PCBs ). Once you add meat to the mid-day meal time, this meal will replace mid-day nursing (or bottle). In Summary: After a few weeks of tasting solid foods, infants will have milk in the morning and evening and also sometimes with fruit afterwards, and then a full lunch menu of vegetables, meat and fruit. At 9 months, it's like at six months but you can add foods like bread, pasta, crackers and small pieces of vegetables, fruits and other foods ( once they have 4 teeth). You can also offer fruit at every meal and in between meals. At 12 months, you continue the same foods like at 9 months. Continue breastfeeding or you can now offer cow's milk (or goat), up to 720ml (24oz) per day. You can also provide all fruits (citrus, kiwi, strawberries) and even chocolate. It is important to monitor your child and make meal time comfortable for them and for you. Your child must be able to play with and touch the food happily. Try to feed your child at times that is in rhythm of the whole family. For example, before work in the morning, at home at lunch time, at 4pm snack/tea time and at evening dinner time. To avoid the risk of choking, do not give pieces of hard raw foods, such as carrots and fennel etc., finely grate them instead. Nuts and olives are to be avoided for the first 4 years. Toddlers eat a 4 course lunch at the créche (high quality subsidized french daycare), which includes a salad course, a then meat or fish with vegetables course, a cheese course and finally fresh fruit for dessert. Babies get the same or similar ingredients, but in purée form. The menu also includes a daily afternoon goûter, snack. There are two cultural factors in the US that contribute to it's high level of obesity rates: Lots of snacking and restaurants with kitchens open all day, every day. There is sort of a free for all culture to eat whenever you want. Whereas in France they create a schedule of strict meal times and allow two hours at lunch to take your time and not rush. Restaurants in Europe are closed in between lunch and dinner service and children are used to eating on a strict schedule so all in all, they tend to not over do it. Despite the fact that french food is rich and buttery (and delicious), the French are actually pretty moderate eaters. Here is a tidbit I read in the Guardian UK newspaper: "[In France] healthy eating is included in the school curriculum: "tasting week" classes introduce children to new foods. Lunch menus (following ministry of education regulations) can't include the same dish more than once a month, so that children are exposed to variety. Most school lunch desserts are simply fresh fruit, children drink water (no sweetened drinks are available, and vending machines are banned in all schools), fried foods are served only a few times a month, and ketchup is allowed a maximum of once a week – and only with foods with which it is traditionally eaten. Why all of these rules? 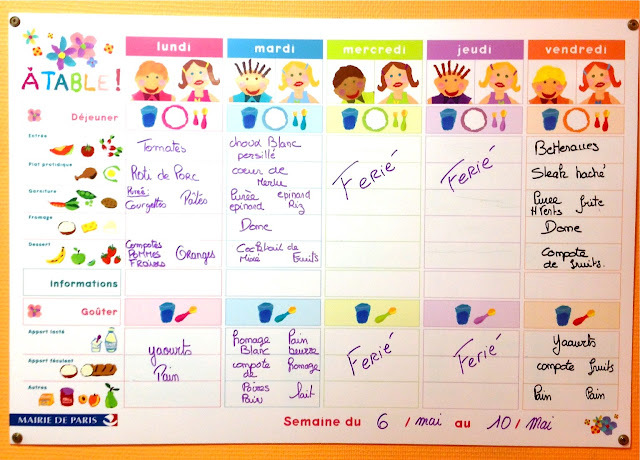 The French believe that teaching children to eat is as important as teaching them to read. In fact, eating well is one of the first skills that parents teach children, from weaning onwards." Thank you so much for this information! I have been reading Bringing Up Bebe and French Kids Eat Everything, and I was wondering how best to incorporate the approaches described in these books. This is a wonderful start! Please tell me I am misreading this article. Are you REALLY saying that, after a few weeks of solids (i.e. at 6 1/2 months) a baby should be down to TWO breastfeeds a day, plus one huge meal of solid at lunch? How exactly is baby supposed to get the nutrition he needs with so little breastmilk? And how is mother supposed to maintain a milk supply only nursing twice a day? A typical baby this age is nursing 6-10 times a day -- not twice. Much else in the article is dated and dubious too -- advice to delay allergins until after year hasn't been current for years now -- and babies don't need 'at least 4 teeth' to eat table foods. Until 12 months, solids are JUST FOR FUN. By all means introduce a variety of healthy and interesting foods as supplements, but breasmilk or formula is the basis of the diet, and is not REPLACED with pureed duck and brocolli.